So Microsoft Office for iPad has finally arrived. 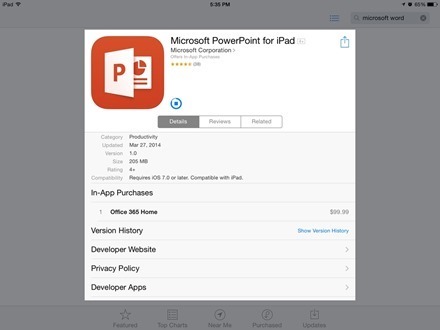 Word, Excel, and Powerpoint apps for the iPad are in the App Store now. It only took Microsoft a little over 4 years to bring the Office suite that apparently is required in order to do ‘real work’ to a tablet they’ve repeatedly said isn’t capable of doing any. Presumably that all changes now. Office for iPad means the iPad is now open for real business. The 3 Office apps for iPad are all free. But … they all require a qualifying Office 365 subscription in order to, well, do real work beyond just opening and viewing files. Office 365 subscriptions start at $99.99 per year and you can get one via In-App purchase. Once you do that you have document editing capabilities and the 3 apps in their full glory. There is a 30-day trial for Office 365, and a Home subscription allows you to install the apps on up to 5 PCs or Macs and up to 5 iPads or Windows tablets. 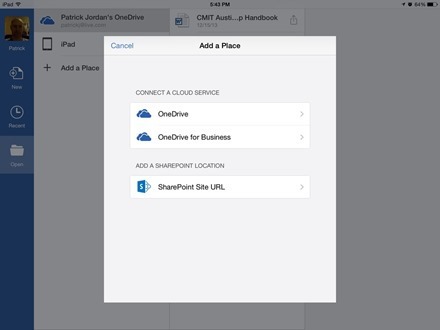 The Office for iPad apps use Microsoft’s OneDrive and Sharepoint for file storage and saving / opening files. The apps also support the iOS ‘Open In’ feature – so you can open Office documents from other places like Dropbox on the iPad. Here are App Store links for Word, Excel , and PowerPoint. Trust me you’ll need them because Apple is not making it easy to find these through search in the App Store, at least for now. I imagine hard-core (real work!) corporate types are going to pounce on Office for iPad right away – and many of them may already have an Office 365 subscription so that makes the decision even easier. I’ve had an Office 365 Home subscription for several months – as it has been helpful as I got back into my old ‘day job’ in IT consulting. So I’ll be testing out the new Office for iPad apps in coming days and will share some thoughts once I’ve had some decent time with them. Please let us know in the comments what you think of Office for iPad. Is it a must-have for work / real work? Is it too little, too late because you’ve already got other apps to work with? I’d love to hear your reactions. Hi patrick, ive been folowing you in flipboard since february 2013 and i love your notes. I have an issue with some calculations for a year aprox and its a complex numbers matrix that i made in excel in 2012. No one app can open correctly my xlsx file. No one until yeterday. The new excel for ipad loads all the complex formulas correctly and it works flawlessly. The price is not convinient for me. I only have one ipad mini and i use an older version of office in my windows pc so the 365 option is too much. I will prefer a single purchase of 15 ~20 dollars for the excel only. I love pages and keynote so the rest of the office suite is not a target either. Thanks for the time to make the notes and sorry for my bad english.